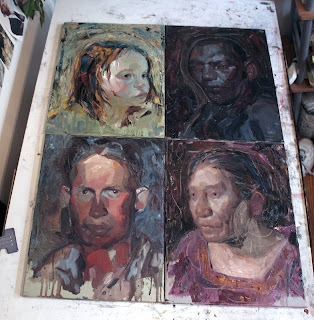 Heres a photo of some work in progress portraits I've been working on. The plan is to now rework them as a whole image now that they are connected. These will probably be almost unrecognizable in the final piece. In other news I will be drawing portraits and giving a demo tomorrow night (Saturday) at Ringling College at the Hammond Commons to benefit this year's Illest of Ill show. The portraits begin at 11pm and I'll begin the demo at midnight (that's early in college time to those wondering why so late). I recently was informed that Bernie Fuchs passed away. By far and away one of the most influential illustrators to have held a brush. Artists made careers with styles he discarded. I am constantly looking at his work and in awe of his accomplishments. We lost a legend. David Apatoff wrote a very sincere tribute to Bernie on his blog. Drawing 'till the last. diggin it! Bottom right is my favorite. I also like that there is less volume in the bottom left. Very nice man! 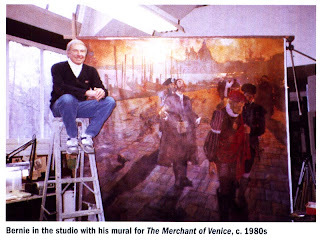 Such an incredible loss with the news of master bernie fuchs, two giants gone within a few years from each other. How big are these portraits? They're looking fantastic, man. These look really fun. I got pretty inspired by how you handled the paint. The finished piece should be great. i love the use of color here- saturation just where its perfect. truly nice! keep it up man! I can't wait to see the final piece, it is very interesting to see how they will evolve and connect with each other. I hope you don't mind me asking, what is your starting point for these? Really really curious to see where you go from here...such different characters with different palettes. I'm sure you'll nail it, as usual. I love your comic style. gotta say, those portraits are pretty profound. dont lose the beauty of some of the looseness, the random shapes of the hair and such. i always prefer work before the final tightness, a clue to the thinking underneath. been figure modeling for hundley. interesting to hear his thinking. sad i missed you at his gallery show- i was there the night before! im scared we're going to lose you to russia. america's a little lost right now, you have a lot of potential power with your visual voice, im working on it, but you have a bigger lead in than i do at this point. maybe by the time you get back from russia i'll be one of the top dogs over here. we'll see. curious to see how your style develops. raul: Really just a toned (grey) canvas and a b%w picture. Don't really plan anything out, just start laying down the paint. Complete opposite of how I illustrate. In that case I really plan things out. abby: Thanks! Soak up as much as you can from Sterling, tell him I said hi! Yeah I like the early stages, after that it's all about not messing them up. Working on that aspect! Your work in progress portraits are wonderful!! Can't wait to see them finished!